When modern-day homeowners think of getting their landscapes redesigned, they don’t just think of planting trees, shrubs and getting turf installed on their property. They want to be able to make optimum use of this space and this is why it’s important that you hire a professional and experienced landscaping company that will be able to understand what your vision is for the space and provide solutions that match your wishes. As your Boston-area landscape designers, we are dedicated to creating luxury, high-end outdoor living spaces for residents in eastern Massachusetts. Most homeowners like to add exterior kitchens to their properties. These quickly become the perfect relaxation and entertainment spot for you, your friends, and your family. In fact, many people find they socialize much more than they did before, but in the comfort of their own backyard. We can add kitchen counters and make space for appliances and equipment such as built-in grills and BBQs. We can also design comfortable seating as required. You can opt for a fireplace or fire pit installation as well. As mentioned earlier, many people like to get an outdoor fireplace installed in their yard. This feature could be a part of the outdoor kitchen or in the yard, itself. 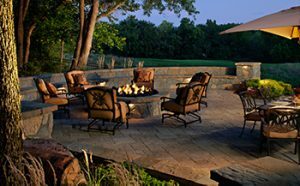 The outdoor fireplace can be made of concrete, brick or natural stone depending on your budget and preferences. Concrete is a very economical option, but many people aren’t impressed with its dull, grey look. This is when we suggest to our customers that they opt for stone or brick veneer on the concrete surface. This adds beauty and charm to the outdoor fireplace or backyard fire pit design. These are very popular features on residential properties and over the years we have constructed many of them. A paver patio is a great way to extend the indoor living space of your home and timber decking is a lovely homey option too. In fact, as mentioned earlier, many of our customers also choose to get outdoor kitchens installed on their patio pavers or decks. Apart from these, we also get requests for the design and installation of custom pergolas, arbors, and gazebos. We are extremely creative and innovative in our approach to our work and can design, build, and install these elements at very reasonable cost. Regardless of whether you want the design and build of the entire landscape to include a dedicated outdoor living space or simply want a custom fire pit to add a cozy touch, we at Ivy Studio can help. We are the Massachusetts landscape design experts that provide comprehensive landscaping solutions. Get started on your landscape design project today or take a look at our other landscape design services we offer to the greater Boston and Massachusetts Bay area.